George H.W. Bush was my friend, but then he had thousands of friends. When you were in his presence, however, you felt that you were his only friend.He listened to you, asked about your wife by name and recalled instances in the past when you were together.after which he would write a note thanking you for the time you had together..Whats not to like, love even, about a man like that.? I , like so many others was proud to be a foot soldier in 41's army and we were devastated that he didn't win a second term.I was with him in State College, Pa. five days before that defeat where he was unselfishly helping me win a tough election even though he could have spent the time more productively elsewhere .He was upbeat and optimistic and gave a great speech. I got so many notes and letters from him that I once wrote him back that I was planning to sell them off to finance my retirement but that he was watering the stock by sending so many signed and handwritten notes to people He wrote back and suggested I burn my collection and buy war bonds instead. The outpouring of admiration and respect for 41 evident this week is not surprising. It is just overdo. The automated telephone greetings at both my Capitol Hill office, and in-district Congressional offices indicated we couldn’t answer the phone because “we are either on another call, or out doing the hard work of freedom.” That phrase – doing the hard work of freedom – came right from President Bush. It was a phrase he used often, and it was the title of a speech he gave on March 4, 1991 regarding the status of the Persian Gulf War. From his days as a WWII naval aviator forward, President Bush seemed to fully understand that securing freedom always entailed hard work; and he devoted his considerable personal energies toward sustaining freedom for the country he dearly loved. I met President Bush a few times during his 1988 campaign trips through Colorado. I served in the Colorado State Senate in those days, and counted it an honor to be invited to various events during the campaign, and subsequent ones that he made to our state as president. My few direct interactions with President Bush were brief, and limited, and only afforded a chance to exchange introductions. However, on one of his 1992 campaign stops, I used the handshake opportunity to mention my disagreement with his approach to Ukraine’s re-establishment of independence in August of 1991. The President had delivered a controversial speech to the Ukrainian Verkhovna Rada (its parliament) which denied support to the Rukh patriots who were, at the time, leading Ukraine’s independence movement. A few weeks after the President’s speech, the Rukh nationalists succeeded. Soviet occupation of Ukraine had ended, and Ukraine was once again an independent nation. It was immediately apparent the President cared about the topic. He indulged me for ten minutes or more – until his staffers pulled him away – sharing his perspective on the important, historic events. It was a rather incredible moment. Regardless of our differing opinions on Ukraine’s path to independence, the President’s thinking on his August 1, 1991 Kyiv speech was deep and complex. It was clear he agonized over the possibility of a violent outcome against the Ukrainian people, a military backlash from Moscow, and a precarious situation involving the U.S.S.R.’s nuclear stockpile in Ukraine. To this day, I believe President Bush cared deeply for the Ukrainian people, and cheered their unaided casting off of Soviet occupation in that now-sovereign country. Throughout the discussion, I sensed the voice of a compassionate man, a deep thinker, and a lover of liberty. And I learned that the work of a statesman is not always understood or appreciated, even by the people who are most directly affected. Hindsight always makes matters clearer. Those were unquestionably complex, tenuous, and somewhat unpredictable times. I remain impressed by the President’s enormous responsibility, and consequence in the matter, but mostly that he agonized considerably over a period of enormous historic significance – one that ended correctly, and almost miraculously without shots fired. President Bush’s unwavering belief in the indomitable American spirit was perhaps projected best by his “thousand points of light” speech, delivered at the 1988 Republican National Convention. It had a particular resonance in Colorado. Many fine Coloradans would eventually earn presidential point-of-light designations, some of whom I was proud to nominate and support for consideration of the award. President Bush had an amazing capacity for caring for others. He respected the reverence of the White House, and the Office of the President which he represented with dignity, and purpose. It was an honor to have met President Bush. It was an honor to have spoken with him about an important event of our day. It was an honor to have served in public office at the same time as President Bush. It is, was, and shall always be an honor to carry on the hard work of freedom as articulated by George H. W. Bush, President of the United States of America. May his soul, and all souls of the faithfully departed, through the mercy of God, rest in eternal peace. I saw his charm on display in the House gym in 1981. I placed a 12 ounce bottle of shaving lotion, the classic brand called Pinaud-Cubman Lilac Vegetal, on an upper shelf of a locker. Not my favorite, so left un-opened. I noticed someone else started using, eventually empty. One day, between Christmas and New Year, I saw a brand new bottle of Lilac Vegetal with a note attached. An official note card, "Vice President of the United States of America," signed by George W. H. Bush, it read, "Happy New Year, I want to start with a clear conscience so I can steal more of this stuff in 1982." He replaced my 12 ounce Lilac Vegetal with a 6 ounce bottle. The Vice President was gracious but not generous that year. President George Bush was a very friendly man, and it was not difficult, when necessary, to get an appointment with him. In addition, he would come to the Capitol to use the gym, and always came to our annual House of Representative's Dinner. So I got to know him. When he lost the Presidential Election, one of his top Aides called me, and asked if I would call the President at his home to "cheer him up a bit." So I did call and told him what a fine President he was, and the terrific staff he had like John Baker, Governor Sunnunu, Dr. Bernadine Healey etc, I thanked him for his kindness to me and his support for my Breast Cancer legislation. I wished him well. He thanked me and kidded that Barbara would have to now put up with him more often. President Bush's enormous Legacy lives on!! Vice President Bush came to Arizona twice to campaign for me when I first ran for Congress—in 1982 when my race was not successful and again two years later when Idid succeed in being elected to Congress. What I remember most about his visits was how exceedingly kind and gracious he was. He showed no hesitancy or displeasure about being on the perpetual Vice-President-election-year-treadmill for candidates around the country. He took a genuine interest in my campaign and gave it a great boost. He insisted on staying at the Arizona Inn in midtown Tucson, a place as elegant and gracious as he was, because he was a good friend and Yale classmate of the long time owner of the Inn. My last contact with him was in 2015 when I went to Kennebunkport with the President, Mark Green, of the Inernational Republican Institute and board members Brent Scrowcroft and Connie Newman to present the IRI Freedom Award to him since he was unable to travel to Washington for the dinner. Once again, he and Barbara showed their kindness by asking us all to stay for lunch though that was not on the agenda for our meeting. Our luncheon discussion was lively and (since Mrs. Bush was present) often very tart! Both President and Mrs. Bush exemplified an era of civility and decency that seems lost in today’s political maelstrom. On September 28, 1989, I had just returned to my office after voting on the floor of the House of Representatives to lower the capital gains tax rate, a priority for the Bush administration but one my Democratic colleagues were strongly opposed to. My phone rang and I was invited to meet President Bush at Andrews Air Force the next morning to accompany him to the retirement ceremony for the Chairman of the Joint Chiefs of Staff Admiral Crowe. The President was visiting South Carolina earlier that morning to inspect the damage from Hurricane Hugo, and I was told he would meet me when Air Force One returned and landed at Andrews and the President and his staff would switch to the presidential helicopter to journey to Annapolis. I am sure the White House invitation was a thank you for my vote but it was certainly a thrill for a young Congressman to accompany the President to the Naval Academy, which was in my district. When Air Force One landed, I quickly boarded the presidential helicopter Marine One, along with the President, his chief of staff John Sununu, and his National Security Advisor Brent Scowcroft. We had a short flight to Annapolis in which we talked about sports, politics, and the Naval Academy. When we landed, I joined the President in the presidential limousine to the Academy and the retirement ceremony. Ironically, two years later, Admiral Crowe endorsed Bill Clinton over Bush for the 1992 election. On January 13, 1991, I had voted to give President Bush approval to go to war against Iraq. It was a tough vote and although the House vote of 250-183 provided a comfortable margin, the vote was made possible by 86 Democrats who crossed party lines and who supported giving the way. Instead, I went home to think about the fact that we might have just declared war, and I tried to rest but slept fitfully throughout the night.President the authority to use force if he felt it was necessary to remove theIraqi army from Kuwait. I was one of those Democrats and knew that the vote would be controversial in my district. My town meetings on the Gulf War vote had turned into shouting matches, and I knew I would get grief from my constituents for my vote. I had canceled a trip to California because I felt the gravity of my vote and the seriousness of sending our troops into harm’s way. Instead, I went home to think about the fact that we might have just declared war, and I tried to rest but slept fitfully throughout the night. The next morning, very early, my phone started ringing and I was hesitant to pick it up lest a constituent was trying to reach me and scold me for my vote. Eventually, I picked up the phone and the operator said it was a call from Camp Springs, Maryland, which was in my district. I immediately hung up to avoid a confrontation. The phone kept ringing and ringing and finally, I picked it up again, and my administrative assistant berated me for hanging up on the President of the United States who was calling me from Camp David. Boy did I feel foolish! On February 26, 1991, I ventured into the House gym to work out and I could see from all the Secret Service agents that President Bush was playing racquet ball with some of his former House colleagues (as a former House member, he still had gym privileges). As I was working out, I was watching CNN and an announcement came over the network that Saddam Hussein had surrendered. By then, President Bush was in the sauna with his buddies. I turned to the Secret Service agents and asked if the President knew about this development, and they told me to go tell him the good news. So I opened the door of the sauna and with steam blocking my view, I said to the President that I had just heard that the war was over. He said, “Tom—that is truly great news and thanks for letting me know.” I’ve wondered how often someone has the opportunity to tell a President that a war is over. After the White House, I would occasionally run into the President. Once I was walking through National Airport and I heard someone holler my name—and I turned and it was President Bush. He was always kind to me—I guess he saw in me the same blend of athletics and politics that marked his own life. President George H. W. Bush will be remembered as a good and decent man who always put country ahead of politics and ambition. The times he reached out to me—a Democrat—showed his willingness to work with his political opponents and cultivate support from both sides of the aisle—even though I often voted against his initiatives and supported Bill Clinton in 1992. I had the privilege of visiting his Presidential library in College Station, Texas, this past year, and it reaffirmed the great honor it was for me to serve as Congressman while he was our president. I will always cherish my memories of his dignity and grace. Etched over the entrance of the George H.W. Bush Library at my alma mater, Texas A&M University, are these words: “Public service is a noble calling…” In an era of cynicism toward government and those who serve in it, George H.W. Bush personified the nobility of lifelong public service. He was a good and decent man whose integrity and humility earned him the deepest respect of Americans from all walks of life. President Bush didn’t just talk about points of light, his life was a light for all of us blessed to have met him. When I was a high school senior in Houston, Texas in 1970, then second-term Congressman Bush was the first Member of Congress I ever met on my first trip to DC, and to this day I can remember how gracious he was to a young student who came from a middle class family with no political connections. When I was a Congressman-elect in 1990, he graciously called and congratulated me on my election—he was the first President I had ever talked to. Nearly 20 years later, at a Texas A&M football game, at my request former President Bush graciously took a photo with Erin Buenger, a beautiful young girl fighting for her life against cancer. Erin, who wanted to be the first female President, tragically lost her fight against cancer at the age of 12, but I will never forget how excited she was to meet President Bush, and I will always cherish the kindness he showed her. The next time someone complains to me about how terrible it is that we have “professional politicians” in our country, I am going to mention the name of George H.W. Bush. Our country is a better place today because he served our nation as a Navy pilot, a Congressman, US Ambassador to the United Nations, an unofficial US Ambassador to China, Director of the CIA, Vice President and President of the United States. If dedicating one’s entire life to public service to country makes one a professional politician, then perhaps we need more of them in office these days. George H.W. Bush was a true patriot. Thank you, Mr. President, for being a shining light for your family, your friends, your fellow Americans and for the world. Because of your friendship and encouragement, our concurrent campaigns and time in Congress together are some of the most treasured memories of my life ... YOU walked your talk! President Bush was a great American and served this nation admirably in some many ways. President Bush always amazed me with his compassion and caring for others. I treasure the notes he wrote me and the phone calls. He never failed to return a call. In politics, that is indeed a rare occurrence He was a special friend to me and so many others over the years. His years of service definitely made their mark on humanity. Not only was President Bush 41 the most well-prepared person ever elected—he was also certainly one of the nicest people ever to serve. In 2006 when he was told by Don Powell, who had coordinated President Bush 43’s Gulf coast recovery effort following Hurricane Katrina and serves on the board of 41’s library and foundation at Texas A&M, that I and my family were vacationing in Maine, the President insisted we come to his house on Walker Point in Kennebunkport the next day. Among other activities there, including a ride in his famous boat, the President took the time to teach my boys, Scott and Clark, how to drive a Segway (picture below)! Great President, even greater human being. George Bush won election to the House of Representatives from Texas' 7th district in 1966 and was re-elected in 1968. Within days after he first took office in 1967, when he came to the Floor, he made a point of introducing himself to the House Republican Cloakroom staff, asking the late Tom Winebrenner and myself our names. It was "Tommy" and "Bob" thereafter, and he never forgot. At Christmas, we received a fifth of Jim Beam from him. I don't recall ever getting a Christmas gift from another congressman. 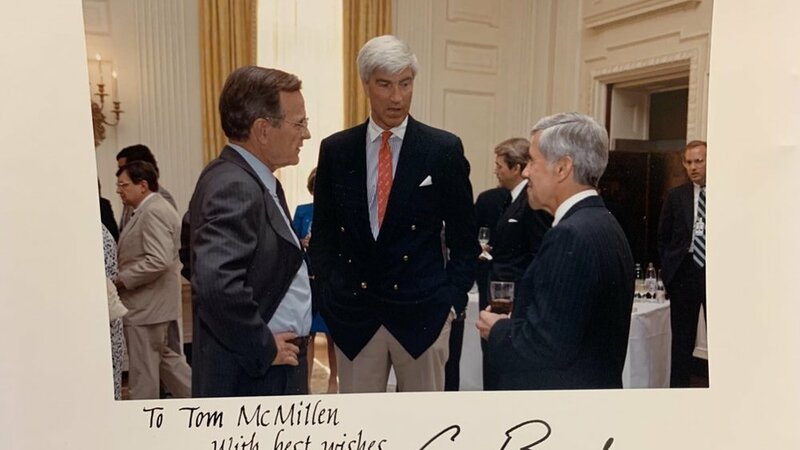 Indeed, as I ran for office, Bush always remembered our initial Republican Cloakroom meeting, as when we posed for my re-election campaign photos. But the true George Bush is underscored by the fact that first photo below was taken at all. It was at the Vice President's official trsidence in Washington in 1982. It was a gathering for conservatives, including officers of the American Conservative Union and others attending CPAC. There had been some question if I would be included, and as soon as I arrived, one of the VP's staff took me aside and said: "Under the circumstances, it would be better if you did not have a photo with Mr. Bush." At the time, I was a candidate for the House again, after my 1980 defeat. I don't know if Bush heard him or not, but within seconds, Bush shook my hand and called to a nearby photographer to take a picture. He wished me well in my election effort, knowing my situation. Another photo taken that day was in every weekly in Maryland's First District a few days later. One of my favorite memories of President Bush was back when he was running for president. Being from Iowa, I had somewhat broken the Republican code as I was supporting Vice President Bush for the presidency. In Iowa, Senator Bob Dole was the king. I liked Bob and had worked for him in later campaigns, however at the time I just felt that HW Bush was the best prepared political candidate we had for the Presidency. Vice President Bush had flown into Omaha, Nebraska which was about 60 miles from where I lived. I was riding with them in the limousine headed for a political function. We talked about country western music, how the farmers are doing in Iowa, and just about anything you would expect to talk to with a real good friend. As we approached the site where I was to introduce Vice President Bush it dawned on me that I did not have any kind of a speech prepared for me by his staff. Here was a man seeking the highest office in the land and he ask an old country boy just to say something nice that I really believe. Wow! Doesn’t get much more honest than that. It was an honor to have known and worked with George HW Bush and most of all know him as a good friend. Rest In Peace. You have earned it! I was honored to have served in Congress during the administration of President George H. W. Bush. He was kind, respectful, and helpful in our meetings — especially during the first gulf war. Because of the skill with which he assembled that huge (and very successful) international coalition, I believe that history will judge him to be one of the finest and most effective foreign policy presidents in history. President Bush was the real model of an American hero. Humble, competent and a true patriot. God Bless him and his family. My fellow Texan George H.W. Bush was the last Member of the U.S. House to be elected President and was one of the most decent men I have ever met in public life. I have several very distinct memories of his time in office. On May 26, 1989, Claude Pepper, the 88 year-old chairman of the House Rules Committee, was terminally ill at Walter Reed Hospital. My office received a call that President Bush would be helicoptering to Walter Reed to present Chairman Pepper the Presidential Medal of Freedom. All members of the Florida delegation and the Rules Committee were invited to the ceremony. The medal presentation was brief and then Chairman Pepper pulled himself together to give a 30-minute acceptance speech about his career. There was not a dry eye in the room. Pepper died four days later. This was one of the most gracious acts any president could do. Pepper was beloved by his colleagues and had been a champion for senior citizens and liberal values in America. I decided that day that there would be a day when President Bush needed my vote on a key piece of legislation and I would vote with him out of gratitude for the kindness he showed to Claude Pepper. I honored that commitment. Later that summer, I attended the annual White House picnic hosted by President Bush. My guests that day included one of my summer interns, Rana Ronson, and her mother Jo Ellen who had been my college girlfriend many years before. President Bush was his usual gracious self and posed for a picture with the three of us. Little did I know that almost 20 years later Jo Ellen and I would be married following the death of my wife Kathy. George H.W. Bush was a gentleman in the best tradition and a true statesman who helped lead the former Eastern European Soviet satellite countries into democracy following the fall of the Berlin Wall. He was able to forge bi-partisan coalitions in Congress and provided real leadership for our country.